From about 1905 to 1908, Oscar F. Cook operated a stock (theater) company in Sandusky, Ohio. 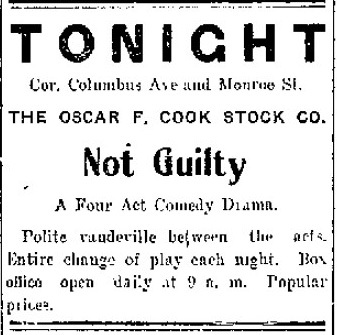 The May 15, 1905 issue of the Sandusky Star Journal reported that the Oscar F. Cook Stock Company performed a play entitled The Convict’s Sweetheart, in a large tent at the corner of Columbus Avenue and Monroe Street in Sandusky. This small advertisement announced a play performed in May of 1905. The four act comedy-drama offered “polite vaudeville” between each act. In September of 1905, the company appeared at the Cedar Point Theater. During the winter of 1905-1906, the company was to open a winter season in Piqua, Ohio. By February of 1907, Mr. Cook announced that he had leased Link’s Hall on West Washington Street. He planned to put on stock company performances at that location, to be known as the New Family Theater. On January 7, 1928 the Sandusky Star Journal reported that Mr. Cook and his family had moved to Kingston, Ontario, Canada, where he had been named president of the Colonial Coach Lines, which operated buses in Kingston and Ottawa, Ontario. 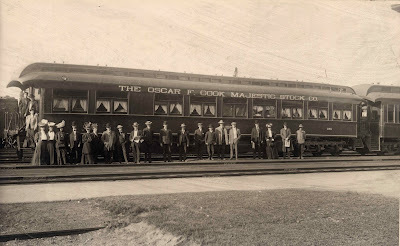 Oscar F. Cook passed away at his home in Kingston, Ontario on March 28, 1947. His remains were brought back to Sandusky, Ohio for burial in Oakland Cemetery.